Amazon is running a 53% off sale on “must have” Blu-ray titles from Paramount Home Entertainment. The online shopping site frequently runs Blu-ray promotions, and this is the latest effort to move some hi-def discs. 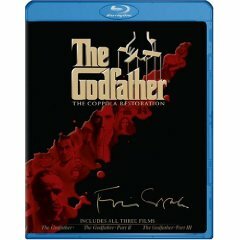 It is the perfect time to pick up The Godfather Coppola Giftset , a 4-disc collection that usually retails for a whopping $124.99, but is now available for $58.99. Titles included in the Paramount promotion include Iron Man (Ultimate 2-Disc Edition), Transformers (2-Disc Special Edition), Tropic Thunder (Unrated Director’s Cut), Eagle Eye, Indiana Jones and the Kingdom of the Crystal Skull, and The Godfather – The Coppola Restoration Giftset. Here is a link to the Paramount Blu-ray sale . Amazon is also running a “Buy More, Save More” sale where you can buy 3 Blu-ray discs and get 30% off, buy 6 discs and get 40% off, or buy 10 discs and get 50% off. There are about 70 titles to choose from, but hurry though because that sale ends Friday.